Airline staff have been having a hard time lately, dragging innocent passengers off of planes and whatnot, but sometimes, people really get what’s coming to them. 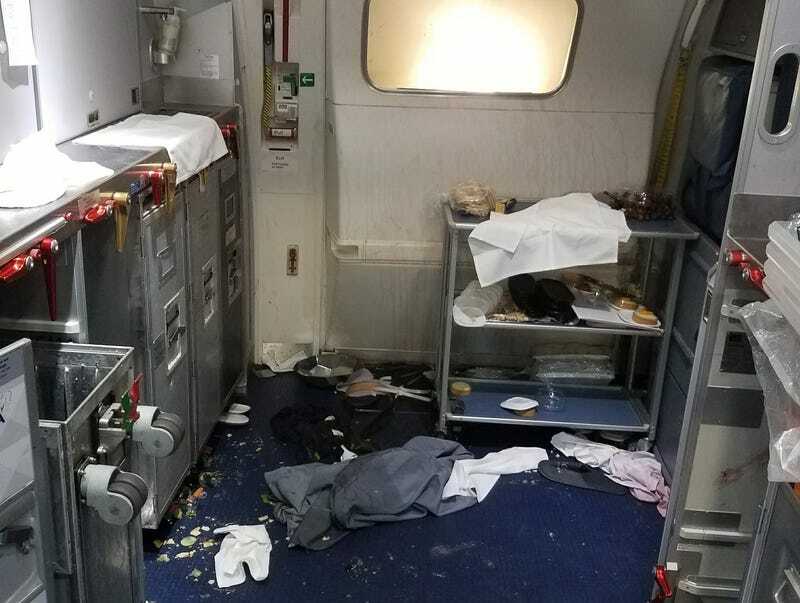 Did Joseph Daniel Hudek IV deserve to have a wine bottle smashed over his head by a flight attendant as Delta Air Lines Flight 129 sailed over the Pacific Ocean toward its destination in Beijing? Based on everything we know, hell yes he did. Hudek, who was flying on a dependent pass courtesy of his mother, a Delta employee, boarded the Boeing 767 at Seattle-Tacoma International Airport a little before 5 p.m. on Thursday. He did not appear intoxicated at the time he sat down, an FBI affidavit confirms. The 23-year-old ordered a beer and was served it, and all was well for about an hour into the flight...until Hudek went to the bathroom. The complaint says that Hudek entered the lavatory briefly before reemerging to ask a flight attendant a question. That done, he returned to the bathroom and was there for around two minutes before he burst out the door and lunged for the emergency exit, grabbing the handle and attempting to open it. What the hell, Hudek! Two flight attendants dove to stop Hudek, who pushed them away and continued to try to open the door. Delta staff later reported that Hudek did successfully move the handle halfway up, and that the door could have opened at the altitude the plane was flying had it been fully disarmed. While one flight attendant continued to battle Hudek, another called the cockpit and told the pilot what was going on, prompting him to turn the plane around and head back toward Seattle. Finally, with the help of a handful of first-class passengers, Hudek was wrestled to the ground and his limbs were zip-tied. The plane and its 210 passengers landed back in Seattle just after 7 p.m., but Hudek wasn’t done: Despite his restraints, he reportedly still managed to flip his wheelchair over in the airport, screaming at people to help him. A flight attendant and passenger were hospitalized with severe facial injuries. According to the Seattle Times, Hudek appeared for a hearing on Friday at the U.S. District Court in Seattle, wearing a beige jail uniform and with a scrape below his right eye. He’s been charged with interfering with a flight crew, which carries a possible sentence of up to 20 years in prison and a $250,000 fine.